Barcelona outlasted the big battle in the final seconds and lifts up the 2019 Copa Del Rey! 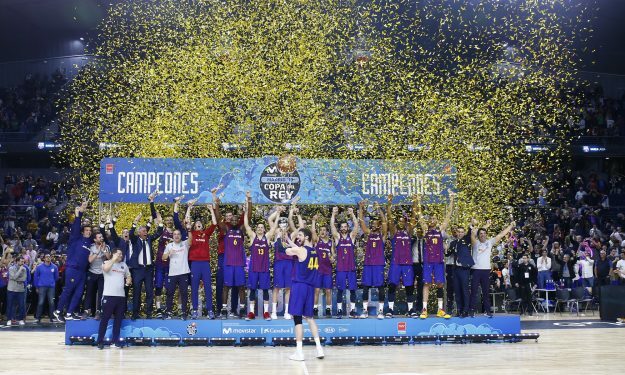 Barcelona outlasted the big battle of the Copa Del Rey final against Real Madrid and with an overtime 94-93 victory lifted the trophy for the second straight season. After trailing by 14 points in the third period, the Catalans bounced back in the last quarter and took charge, though incredible Sergio Llull sent the game to overtime by tying the score at the buzzer (77-77). What followed in overtime was intensity, with some controversial calls stirring up trouble in the final seconds and the final result of the game was in favor of Barca. Thomas Heurtel, who paced the winners with 22 points and six assists was named the well-deserved MVP. On the other side of the court, Facu Campazzo posted a team-high for Real Madrid with 19 points.